On 18 June 2017, a Syrian fighter jet was conducting a mission against ISIS militants. A U.S. fighter jet then shot down this Syrian warplane. U.S. Central Command told Reuters that the Syrian plane was shot down in 'collective self-defense of coalition partnered forces' after Syria had targeted coalition partnered forces. The U.S is said to be partnered with ISIS. US Shoots Down Syrian Warplane for First Time. America Created Al-Qaeda and the ISIS Terror Group - Global Research. Your source is a blog ? The "Sharia loving Muslims" you allude to are, in large part, Saudi fundamentalists. They are systematically subverting the culture of various states around the Arab world and replacing it with radical Sunni Islam. You can see the effect of their systematic campaign in groups like the Muslim Brotherhood. Their violent takeover of governments all over the Arab world in places like Egypt and Libya is funded by, organized by, and executed in part by and with the complete and total complicity of war criminals like John McCain, Hillary Clinton, and any stooge of Benjamin Netanyahu. It is the same forces that are literally taking Syria apart piece by piece and destroying its society, though, thanks to the resolve of the brave, loyalist men of the Syrian military, and in spite of all odds against them including the vacuum of compatriot fighters created by unlawfully enforced immigration programs out of Syria funded by George Soros, they are finally being beaten back to the gates. Edit: Even the Neocon apologist article below admits the involvement of Muslim Brotherhood in Syria. There is no denying the connection any longer. Even trashy neolib Zionist rag "National Review" admits bloodthirsty Neocon hawks Lindsey Graham and John McCain are, in fact, behind the Muslim Brotherhood. Senators John McCain and Lindsey Graham have taken time off from helping install an Islamist government in Libya (mainly the Muslim Brotherhood, with some help from al Qaeda) and calling for the arming of the Syrian “rebels” (mainly the Muslim Brotherhood, with some help from al Qaeda) to heap praise on the Muslim Brotherhood in Egypt. The Brothers, furthermore, have unmitigated contempt for the West and seek the eradication of Israel. Qaradawi promises that Islam will conquer America and Europe and has issued fatwas approving suicide bombings in Israel and against American troops in Iraq. The terrorist organization, Hamas, is the Brotherhood’s Palestinian branch. The Brotherhood’s agents in America have written that their mission here is a “grand jihad” to eliminate and destroy Western civilization from within by sabotage. Mr. McCain (R., Ariz.) and his delegation of four other senators, three of them Republicans, also hinted at warming relations between conservative American lawmakers and the Muslim Brotherhood, an Egyptian Islamist group whose triumphant performance in parliamentary elections rattled U.S. nerves among U.S. policy makers. The warm comments mark a climbdown from previous threats by congressmen from both parties that the prosecution of American NGO staff will endanger the $1.3 billion in aid that Washington has given Egypt’s military each year since 1987…. Muslim Brotherhood leaders in Egypt’s newly elected Parliament also told the lawmakers that they would redraft a restrictive NGO law that the deposed regime of President Hosni Mubarak used to repress civil-society organizations. “After talking with the Muslim Brotherhood, I was struck with their commitment to change the law because they believe it’s unfair,” said Sen. Lindsey Graham (R., S.C.), who was traveling with Mr. McCain. 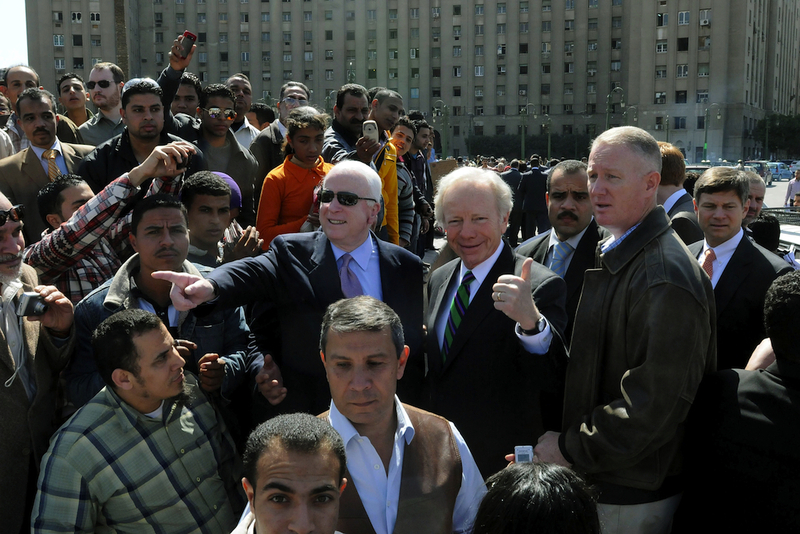 Mr. Graham and other lawmakers praised the Brotherhood, whose Freedom and Justice Party won a plurality of nearly 50% of the seats in Parliament, as a strong potential partner for the future of U.S. relations with Egypt. of the seats in Parliament, as a strong potential partner for the future of U.S. relations with Egypt. Well they probably would if they were as dependent on American taxpayer billions as Egypt is. Which reminds us: Why is our country, which is $16 trillion in debt and sinking deeper by the second, giving a dime to Islamist countries that despise us? We can’t afford it. Plus, the more we spend on the region, the more anti-American the region becomes. And why is that? Because, though we may realize that outfits like IRI (and its Democratic counterpart, the National Democratic Institute for International Affairs) are outrageously overfunded sinecures for apparatchiks who are between government gigs, mainstream Muslims perceive them as a Trojan Horse designed by the West to corrupt Islamic values and undermine Islamic civilization. Meantime, as he steers the GOP toward Obama’s goal of cozier relations with Egypt’s Islamists, we are again reminded of how lucky we are to have elected to the senate a real statesman like John McCain — as opposed to one of those rightwing whackjobs like J.D. Hayworth, who clearly lack the foreign-policy depth and nuance to appreciate how moderate the Brotherhood truly is. Don’t say you weren’t warned. Back in 2008, I argued that McCain’s reputation as a tower of national-security strength is a myth, that “in reality, a McCain presidency would promise an entirely conventional, center-left, multilateralism” — i.e., “the same agonizing over European and Islamic perceptions of America; the same doctrinaire commitment to the alchemy of democracy promotion; and the same fondness for heaping more unaccountable bureaucratic sprawl atop the already counterproductive agencies and multinational institutions that frustrate the United States at every turn” that are staples of Democratic party dogma, and that were on display in the second Bush term. We did not get the McCain presidency, but we have gotten the McCain foreign policy where truckling to Islamists is concerned. When it comes to the Muslim Brotherhood, it turns out that mavericks and community organizers are on the same page. Bonus: Who else in the pack, but the virtue signaling warhawk, Jew and Israeli dual citizen Joe Lieberman. I guess what they say about the value of pictures in terms of spoken words is true. Priceless! TEHRAN (FNA)- The American Army has relocated several ISIL commanders with important information on the US by conducting heliborne operations in Raqqa province. The US-led coalition helped four senior ISIL commanders to escape Raqqa province in a heliborne operation that included six helicopters flying in al-Rafedin region in al-Tabaqa town in Southwestern Raqqa, local sources in Raqqa said. The sources, meantime, noted that the Syrian Democratic Forces (SDF) had besieged the region where heliborne operations were conducted. Meantime, the Arabic-language service of the Russian Sputnik News Agency said that the relocated ISIL terrorist commanders had previously fled to Raqqa after the Syrian and Russian armies conducted military operations to set free the city of al-Qoryatayn in Homs province. It noted that the ISIL commanders most probably have secrets of the US Army troops with them. In a relevant development last month, a source close to Kurdish forces said that the US Army was taking ISIL's gold treasure that is estimated to weigh around 50 tons from Eastern Syria to America. The Kurdish-language Bas News quoted a Kurdish source as saying that the Americans have transferred tens of tons of the gold ingots they have seized from the ISIL terrorists in Baghouz region in Southeastern Deir Ezzur to their own country and only kept a small portion of the treasure to be given to the Kurdish fighters. In a relevant development also month, the US Army troops took out a sum of 40 tons of gold ingots belonging to the ISIL in heliborne operations after agreeing with the terrorist group and while Washington is preparing to announce the end of ISIL in Eastern Euphrates. Also last month, the London-based Syrian Observatory of Human Rights (SOHR) said the Washington-backed militants were trying to find and seize millions of dollars and at least 40 tons of gold left behind by the ISIL terrorist group. The SOHR reported that the ISIL terrorists had stolen about 40 tons of gold and millions of dollars from the population once under their control in Iraq and Syria, which was later transferred to Eastern Euphrates in Eastern Deir Ezzur. "The US-led coalition forces and the SDF deliberately do not target the areas under the control of the ISIL terrorists and commanders in Eastern Euphrates in Deir Ezzur as they are trying to locate this treasure by forcing the ISIL militants to speak about its location after surrendering," it quoted informed sources as saying. They noted that part of the cash dollars and gold have been transferred from Turkey to the areas under the ISIL control by Turkish brokers and intelligence service who have close ties with the ISIL. Meantime, an SDF Commander, Adnan Afrin, said that the ISIL is now under the siege of the SDF in an area no larger than one square kilometers in Eastern Euphrates. In a relevant development earlier in February, a prominent Syrian military expert revealed that Washington plans to transfer the remnants of the ISIL terrorists from Eastern Euphrates to other regions through Turkey and Iraq. The Arabic-language website of Sputnik quoted Brigadier General Mohammad Issa as saying that less than 600 ISIL militants are stationed in a 4-km/sq region in Eastern Euphrates who will be soon evacuated from the region to foreign territories. He added that the operations to transfer these militants will be conducted similar to the operations earlier carried out to evacuate the ISIL terrorists from Raqqa, saying that the US forces will transfer them via Iraq or Turkey to some other Arab states for future operations. Issa questioned the US forces' claims of fighting against the terrorist groups along with the SDF, stressing that the Syrian army will soon move to retake control over this region. Media reports said last Sunday that the US army had agreed with the ISIL on the latter's exit from areas under Washington's control in Eastern Euphrates. The US-led coalition troops and the SDF had reached an agreement with the ISIL terrorists on the militants' retreat from areas under the control of the US and its allied forces, the Arabic-language al-Mayadeen TV news channel reported. The report comes as the SDF claimed that it had started the final battle for uprooting the remaining elements of the ISIL from Eastern Euphrates. Also the Arabic-language service of RT quoted media activists as saying on Saturday that the US-led coalition forces have carried out heliborne operations in the Eastern Badiyeh of Deir Ezzur. It added that two US Apache helicopters have landed in Falitah region of Eastern Badiyeh of Deir Ezzur, taking away 7 big boxes whose contents were not known.